Tan gold, green, brown, black, and cream. Makes a perfect gift. New in for the new A/W season. Supplied in sealed poly bags. This beautiful fine Pashmina is incredibly versatile . gorgeous grey / purple colourings with pretty contrasting blue white & yellow detail. Stunning Pashmina patterned with detailed tapestry style large flowers. Quality Fairtrade product. 100% Pashmina silk from Thailand. size is 70cm wide by 160 cm long. Beautiful long and wide Hand Drawn Polyester scarf from Joules, nice crisp awhile background with vibrant Blue strips down one side with a fabulous Blue and Pastel coloured floral design. The scarf measures 2 metres x 70cm and has been fully cleaned so ready to wear. There is no damage, no marks and no stains and is from a smoke free home. Pretty Pashmina Shawl Wrap BNWT Purple Scarf Soft Fabric. Condition is New with tags. Dispatched with eBay delivery – Shutl 2-3 days. This beautiful fine Pashmina is incredibly versatile . Wonderfully with a contrasting reverse very much like the back of a rug with contrasting undertones. WE HAVE PRODUCED OUR OWN WEBSITE AND HAVE SUCCESSFULLY ATTENDED A NUMBER OF FABULOUSLY AMAZING GIFT FAIRS. Excellent quality fabric it drapes and falls beautifully, large enough to be worn in a number of different styles, the perfect fashion accessory. This beautiful fine gold thread Pashmina is incredibly versatile . Striking blue colourings with a pretty contrasting reverse. Stunning Pashmina patterned with leafy & floral swirls. This does not effect the wearability of the scarf and can only be seen on very close Lots of pictures attached. This beautiful fine gold thread Pashmina is incredibly versatile . Striking blue colourings with a pretty contrasting reverse. Stunning Pashmina patterned with leafy & floral swirls. Scarves will be lovingly wrapped in quality gift paper and sealed with our little owl. Pink & Navy Scarf/Pashmina in Floral Print (Orchids and Leaves), rich jewel like colours. Absolutely beautiful. Beautiful design and soft against the skin. Rectangle in shape and oversized. Very versatile and can be worn in so many ways and can glam up an outfit in an instant. Brand new with tags and comes in it's own cellophane packaging which is useful for gifting or a little treat for yourself. Please take a moment to look at my other listings as I have so many lovely pieces on my listings. Thank you..
Lovely Peach coloured sequined scarf/ pashmina. With Fringe. Large Scarf/Shawl. See photos. New listingGorgeous wine,brown and silver metallic look pashmina scarf wrap, fringed. Gorgeous metallic look wrap / pashmina /scarf. Silver, wine and brown colours. Black and silver fringed ends. Used but in excellent condition. 160cm length not including tassels at each end. 68cm wide. From a smoke/ pet free home. Beautiful glitter gold and green pashmina shawl. Wrap around for elegance and warmth!Dispatched with Royal Mail 1st Class. Tulip floral print. Grey with black. New in for the new season. Supplied in sealed poly bags. Delicate ditsy floral print. Silver grey and soft white. Makes a perfect gift. Quality Scarfs. New in for the new season. Mustard Floral Scarf/Pashmina/Shawl in the most beautiful Print (on a Mustard Background) with Large Florals in Rich Autumnal/Wintery Colours. Stunning colours. 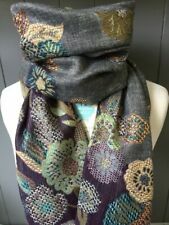 So versatile and can be worn in many ways, Scarf, Pashmina, Wrap or Shawl. This beautiful fine Pashmina is incredibly versatile in pretty tones of red & gold . Stunning Pashmina patterned with large flowers. Contrasting reverse almost like a rug shown in picture 6. Scarves will be lovingly wrapped in quality gift paper and sealed with our little owl. Daisy floral print. Silver grey and white. Makes a perfect gift. Quality Scarfs. New in for the new A/W season. 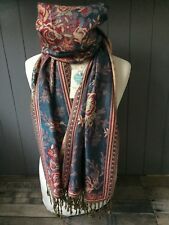 Ladies Beautiful Pashmina Scarf Wrap. 100% smooth weave polyester fabric very soft. Beautiful Bright floral and fruits print. White Red Gren. Makes a perfect gift. Quality Scarfs. Supplied in sealed poly bags. Beautiful large leafy floral design. Shades of grey. Makes a perfect gift. New in for the new A/W season. Supplied in sealed poly bags. Pashmina (l x w): 190cm x 70cm (74.8" x 27.5"). Joe Browns Embroidered Pashmina. Colour: Burgundy. 73% polyester, 27% viscose. Large pashmina style scarf stole which could be used as a sarong. Very pretty bird and floral pattern on soft green. Beautiful Embroidered Small Daisy Scarf Pashmina Wrap. Pale turquoise / blue. about Embroidery. Beautiful scarfs for the season this season all. Care / Hand washable in cool water. Made from superior quality yarn giving that soft wool like texture. This pashmina has intricate embroidery flower and vine detailing. It drapes and falls beautifully due to its weight, softness and density of the weave. Pashmina Scarf Flower Print Warm Winter Shawl. Beautiful Warm Soft Pashmina Scarf, can also be used as cover-up or wrap. Pashmina style. This is a beautiful, high quality Shawl, which is very soft to touch, and warm for cold evenings. Other Side Black Red Grey Tartan. Reversible: Blue Mixed Floral One side. 100% Polyester. Modern daisy floral design. Black Grey White. The main color is grey. Makes a perfect gift. New in for the new A/W season. Supplied in sealed poly bags. Woven weave fabric layered. Graduated floral design. Pink, Blue, Beige, Orange, Green. New in for the new A/W season. Quality Scarfs. Supplied in sealed poly bags. Material: The shawl is made from pure 100% wool. This design is suitable for ladies of all ages and for all occasions, be it a wedding, party or anniversary. Colour: yellow with a black border patyern material. Beautiful Abifs Rush Ke Kashmir pashmina wrap black embellished 27" x 78"
Add to your wardrobe with one of these floral rectangular pashminas. These floral pashminas have a feminine pattern, so you can add a lovely accent to your attire. With a traditional design, these pashminas will always be on trend. Designed to add a stylish touch to your look, they are great for making a fashion statement. Rectangular pashminas can be wound around your neck in different ways and are designed in different lengths, giving you a wider array to choose from. Thanks to their easy to match colour, blue pashminas will pair well with any look. They are a popular choice and are available in a wide selection of shades, from light to dark blue, so you can choose the colour that best complements your wardrobe. With elegant designs, pink pashminas are the perfect accent pieces for completing any outfit. Pink pashminas add a small pop of colour to any wardrobe and have cheerful and lively hues, so you can choose between a bright, vibrant scarf or a softer tone. Elegant and timeless, 100% silk pashminas are wonderful for accessorising your ensemble. They feature a delicate finish and have a luxurious style, bringing a hint of elegance to your wardrobe. Thanks to their insulating fabric, lambswool blend pashminas are great for staying bundled up and warm throughout the winter. These pashminas are designed from stretchier materials, providing more flexibility and their lambswool blend is quick-drying for added convenience and ease of movement.